Gynura procumbens (Lour.) Merr. (Family Asteraceae) is a medicinal plant commonly found in tropical Asia countries such as China, Thailand, Indonesia, Malaysia, and Vietnam. Traditionally, it is widely used in many different countries for the treatment of a wide variety of health ailments such as kidney discomfort, rheumatism, diabetes mellitus, constipation, and hypertension. Based on the traditional uses of G. procumbens, it seems to possess high therapeutic potential for treatment of various diseases making it a target for pharmacological studies aiming to validate and provide scientific evidence for the traditional claims of its efficacy. Although there has been considerable progress in the research on G. procumbens, to date there is no review paper gathering the reported biological activities of G. procumbens. Hence, this review aims to provide an overview of the biological activities of G. procumbens based on reported in vitro and in vivo studies. In brief, G. procumbens has been reported to exhibit antihypertensive, cardioprotective, antihyperglycemic, fertility enhancement, anticancer, antimicrobial, antioxidant, organ protective, and antiinflammatory activity. The commercial applications of G. procumbens have also been summarized in this paper based on existing patents. The data compiled illustrate that G. procumbens is a potential natural source of compounds with various pharmacological actions which can be utilized for the development of novel therapeutic agents. Gynura procumbens (Lour.) Merr. (Family Asteraceae), is a small plant ~1–3 m in height. The stems are fleshy and the leaves are ovate-elliptic or lanceolate (Rahman and Asad, 2013). It has scientific synonym names such as Gynura sarmentosa DC and Cacalia sarmentosa Blume (Quattrocchi, 2012). The plant leaf is commonly consumed and scientifically it has been shown to be safe for consumption (Rosidah et al., 2008). In Malaysia, the fresh leaves of G. procumbens are commonly eaten raw and in Thailand, the leaves are also used for cooking (Kaewseejan et al., 2015). In Malay, G. procumbens is called Sambung Nyawa which means “prolongation of life” whereas in Chinese, it is called Bai Bing Cao which means “100 ailments” (Bodeker et al., 2009). This is because it has been utilized in traditional medicine both systemically and for topical application for treatment of different types of illnesses and diseases (Krishnan et al., 2015). For example, it is widely used to relieve kidney discomfort in Indonesia and people have been using it for the treatment of fever in Vietnam. In Thailand, it is commonly used to alleviate inflammation, rheumatism, and to cure viral ailments (Wiart, 2006). The beneficial properties of G. procumbens have been attributed to the presence of bioactive compounds such as flavonoids and glycosides in this plant (Akowuah et al., 2001, 2002). Throughout the years, intensive research done on G. procumbens has provided extensive scientific evidence of its therapeutic potential. The present review aims to provide an overview of the biological activities of G. procumbens with reference to the available literature. The vast potential medical applications of G. procumbens based on the consolidation of the scientific findings of research on this plant are also highlighted. Hypertension is a key risk factor for several cardiovascular diseases including coronary vascular disease and stroke (Lu et al., 2012). Over the past few decades, significant effort has been expended to explore medicinal plants with antihypertensive therapeutic effect, including G. procumbens (Lam et al., 1998). To date, the administration of G. procumbens has been reported to result in significant lowering of systolic blood pressure and mean arterial pressure in hypertensive rats (Hoe and Lam, 2005; Kim et al., 2006; Hoe et al., 2007). Additionally, the treatment with G. procumbens extract has also resulted in significant decrease in heart rate, strong negative chronotropic, and negative ionotropic effects at rats' right atrium and left atrium respectively (Hoe et al., 2011; Kaur et al., 2012; Abrika et al., 2013). Angiotensin (Ang)-converting enzyme is important for blood pressure regulation. It converts Ang I into Ang II, the peptide hormone with potent vasoconstrictive effects (Lote, 2006). Interestingly, the blood pressure-lowering effect of G. procumbens was associated with its inhibitory effect on angiotensin-converting enzyme activity (Hoe et al., 2007). In addition to that, G. procumbens has direct inhibitory effect on the activity of Ang II. This was demonstrated in the study that reported the inhibition of Ang II- induced contraction of aortic rings treated with fraction of G. procumbens (Poh et al., 2013). In terms of mechanism of action, G. procumbens possibly antagonizes the vasoconstrictive effect of Ang II through endothelium-dependent pathways that involve the activation of nitric oxide and prostaglandin release (Poh et al., 2013). This is supported by the reduction of inhibitory effect of G. procumbens aqueous fraction on Ang II-induced contraction in the presence of cyclooxygenase inhibitor and endothelial nitric oxide synthase inhibitor (Poh et al., 2013). This was also supported by another research finding which found increased serum nitric oxide level in hypertensive rats treated with G. procumbens extract (Kim et al., 2006). Another possible mechanism of the vasodilatory effect of G. procumbens is inhibition of extracellular Ca2+ influx. Vasocontraction caused by phenylephrine, calcium and potassium chloride was shown to be antagonized by G. procumbens extracts. This was probably due to the blocking of receptor-operated and/or voltage dependent calcium channels as well as opening of potassium channel (Hoe et al., 2011; Ng et al., 2013). Therefore, G. procumbens potentially serves as an antihypertensive agent with cardioprotective activity due to its ability to target various mechanisms including the renin-angiotensin system and calcium influx which are crucial players in the pathophysiology of hypertensive conditions. G. procumbens is commonly used for diabetes treatment in traditional medicine and its hypoglycemic effect has been reported in in vivo studies (Hamid et al., 2004; Algariri et al., 2014). One intriguing finding on G. procumbens, is its specificity in inducing hypoglycemic effect only in diabetic animals as it has been shown to cause a significant decrease in fasting blood glucose levels and suppression of glucose elevation during glucose tolerance test in diabetic rats but not normal rats (Zhang and Tan, 2000; Algariri et al., 2013). The effect of G. procumbens treatment on insulin level has been investigated. Hamid et al. (2004) has reported the stimulation of insulin secreting cell lines by G. procumbens extract. However, the exposure of clonal pancreatic cells with extract of G. procumbens did not stimulate insulin secretion (Hassan et al., 2008). These contradicting results might be due to the differing response of different cell lines when treated with G. procumbens. Therefore, its effect on insulin secretion has been further tested using in vivo studies. However, no significant change has been observed in plasma insulin level in diabetic rats treated with the extracts, implying that the hypoglycemic activity of G. procumbens does not rely on insulinotropic activity but may instead be due to its extra-pancreatic effect (Hassan et al., 2008; Lee et al., 2012). Other pathways explored in the research include experiments on the antidiabetic effect of G. procumbens focusing on glucose uptake activity. The findings showed G. procumbens treatment stimulated glucose uptake on 3T3 adipocytes. Furthermore, an enhancement of activity was found in the presence of insulin (Bohari et al., 2006). Further validation was then conducted via in vivo work. The report showed an enhanced uptake of glucose by muscle tissue of diabetic rats, indicating a direct effect of G. procumbens extract on glucose uptake and utilization at the peripheral levels (Hassan et al., 2010). With reference to metabolic pathways, G. procumbens was found to exert an effect on glucose metabolism in liver. It was demonstrated to cause phosphorylation and inactivation of glycogen synthase kinase 3 (GSK3) in the liver of diabetic rats, suggesting that the hypoglycemic action of G. procumbens is due to either direct or indirect effects on the upstream component(s) activities in the insulin signaling pathway (Gansau et al., 2012). In addition, it stimulated an increase in activity of glucokinase and pyruvate dehydrogenase and phosphorylation of ATP-citrate which are known to play roles in glucose metabolism (Kang et al., 2015). Furthermore, an enhancement of liver hexokinase, phosphofructokinase and fructose-1,6-bisphosphatase specific activity were also found following treatment. This indicates G. procumbens stimulated an increase in utilization of hepatic glucose and decreased endogenous glucose production (Lee et al., 2012). There has also been work examining the hypoglycemic effect of G. procumbens in combination with other herbal therapies. It was observed to achieve a stronger hypoglycemic effect when G. procumbens was used together with Azadirachta indica or Andrographis paniculata (Pramono and Nugroho, 2015). The synergistic effect is postulated to be related to the diverse range of active compounds present in the extract combination (Sunarwidhi et al., 2014). Taken altogether, the current evidence suggests the presence of bioactive principles which possess insulin mimetic properties in G. procumbens (Hassan et al., 2010). Aside from direct treatment of diabetes, research on G. procumbens has also explored its potential in treating infertility, which is one of the complications of diabetes (Ramalho-Santos et al., 2008). G. procumbens was found to exhibit an effect on sexual and reproductive function as the treatment with G. procumbens significantly increased sperm count, sperm motility, and reduced the percentage of sperm mortality of diabetic rats (Sani et al., 2008). G. procumbens was also demonstrated to have the aphrodisiac properties as evidenced by an increase in mounting frequency of diabetic rats following the treatment (Noor and Radzuan, 2012). In term of enzymatic activity, G. procumbens was found to promote testicular lactate dehydrogenase activity (Hakim et al., 2008). This finding can be correlated to improved fertility because lactate dehydrogenase is known to play a crucial role in spermatogenesis (Kaur and Bansal, 2004). Overall, studies clearly suggest that G. procumbens may improve the reproductive function of infertile diabetic males, particularly through an increase in sperm counts, quality, and motility. G. procumbens has long been used as traditional treatment for cancers such as leukemia, uterine, and breast cancers (Agustina et al., 2006). This has prompted scientific exploration of the antitumor activity of G. procumbens (Maw et al., 2011). Short term (10 weeks) treatment of the ethanolic extract was found to suppress the progression of nitroquinoline 1-oxide-induced tongue carcinogenesis during initiation phase. Longer period (26 weeks) of administration was demonstrated to lead to high suppression of oral carcinogenesis (Agustina et al., 2006). The ethanolic extract was also shown to be effective against carcinogenetic effect of 7,12-dimethylbenz(a)antracene on liver (Nisa et al., 2012). G. procumbens has been also tested on osteosarcoma cell line. The treatment has resulted in inhibition of cell proliferation and was observed to suppress the invasive and migratory abilities of the cancer cells (Wang et al., 2013). Recently, ethanolic extract of G. procumbens was shown to cause about 80% decrease in azoxymethane-induced aberrant crypt foci in rats which indicates potential in preventing colon cancer (Shwter et al., 2014). G. procumbens has also demonstrated its potential in preventing breast cancer. It was shown to cause effective suppression in proliferation of breast cancer and epithelial cells of mammary glands. Besides, the further studies conducted has proven that the treatment of G. procumbens was able to reduce the tumor incidence in the animals tested (Meiyanto et al., 2007; Hew et al., 2013; Gofur et al., 2015). Mechanistically, G. procumbens inhibits the initiation phase of carcinogenesis. The treatment with ethanolic extract caused a significant reduction in expression and activity of cytochrome P-450 enzymes such as CYP3A4, CYP1A2, and CYP1A1 (Afandi et al., 2014; Ghofur et al., 2015). This inhibition may lead to a lower risk of cancer as it will result in a reduction in the conversion of the respective procarcinogens to cancer triggers (Afandi et al., 2014). In addition, G. procumbens treatment has also been shown to stimulate expression of glutathione-transferase which is involved in the detoxification of carcinogenic compounds. These activities help to prevent cancer formation at its initiation phase (Hamid et al., 2009; Ghofur et al., 2015). Cancer patients frequently consume herbal medicine as complementary and alternative medicine while undergoing chemotherapy (Cheng et al., 2010). In view of this, co-treatment studies of G. procumbens and chemotherapy drugs have been carried out. The combination of G. procumbens extract with doxorubicin or 5-fluorouracil resulted in strong synergistic effect against breast and colon cancer cells (Meiyanto and Jenie, 2007; Nurulita et al., 2011, 2012). However, co-treatment of G. procumbens with cisplatin appeared to be antagonistic as this combination failed to further suppress cancer cell proliferation (Nurulita et al., 2011). This demonstrates that the concomitant use of G. procumbens with different chemotherapy drugs might result in variable treatment efficacy. In general, the blockade of angiogenesis pathways will result in inhibition of growth, invasion, and metastasis of tumor cells (Hamid et al., 2011). G. procumbens was shown to exhibit antiangiogenic activity as the treatment caused inhibition in expression of vascular endothelial growth factor and prevented formation of new blood vessels on fertilized chicken eggs (Jenie et al., 2006; Hamid et al., 2013). Based on the reported studies, G. procumbens appears to be an effective chemotherapeutic agent against a wide range of cancer cell types and it exerts its anticancer activities via the modulation of various points of carcinogenesis including cancer initiation, cell proliferation, metastasis, and angiogenesis. The increasing incidence of resistant strains of malaria, viruses and also bacteria to currently available drugs makes the search for alternative therapeutics from herbal plants a key area of interest (Tan et al., 2015). The antiplasmodial activity of G. procumbens was first reported by Vejanan et al. (2012). The research shows that G. procumbens extract exhibits chemo-suppression effects toward malarial parasite strains of Plasmodium falciparum 3D7 and Plasmodium berghei NK65; possibly via direct inhibition of GSK3 or indirect action on pi3K/Akt pathway. Besides, the ethanolic extract of aerial plant parts has been demonstrated to exhibit virucidal and antireplicative activity against herpes simplex virus HSV-1 and HSV-2. This was validated in a clinical trial on patients with recurrent herpes labialis where treatment with G. procumbens herbal gels reduced the number of patients infected with HSV (Jarikasem et al., 2013). Meanwhile, the antibacterial activities of G. procumbens have also been tested with the extract exhibiting antibacterial activity against gram-positive and gram-negative bacteria such as Bacillus cereus, Pseudomonas aeruginosa, Vibrio parahaemolyticus, and Salmonella typhi (Rahman and Asad, 2013; Zheng et al., 2014). The antifungal activity of G. procumbens against fungi such as Candida albicans and Aspergillus niger was also observed. The findings of these studies have provided supporting evidence that substantiate the traditional use of G. procumbens in the treatment of infections by pathogens such as herpes simplex virus and malaria parasites (Kaewseejan et al., 2012; Nasir et al., 2015). The antioxidant activity of G. procumbens extracts was assessed via DPPH assay to measure its free radical scavenging ability (Akowuah et al., 2009; Afandi et al., 2014). In a comparative study, the ethanol extract of G. procumbens exhibited the highest percentage of DPPH inhibition (52.81%) among different types of plant extracts that were tested (Maw et al., 2011). Meanwhile, the reductive ability of G. procumbens extract has also been tested by using ferric reducing assay which has further proven the antioxidant capacity possessed by this plant (Kaewseejan et al., 2015). Further examination of the antioxidant activity via a range of different assays including trolox equivalent, β-carotene—linoleic acid, and xanthine oxidase inhibitory assays have also been explored. Based on the reported data, G. procumbens was found to display substantial antioxidant activity (Rosidah et al., 2008). Since lipid peroxidation is a common result of oxidative stress, the antioxidative effect of G. procumbens was revealed when it inhibited lipid peroxidation with the median effective concentration of 2.75 mg/mL (Luerang et al., 2010; Kumar and Pandey, 2013). In addition, the administration of methanol extract prior to oxidative stress induction was able to reverse the elevation of plasma lipid peroxidation in tested animals (Akowuah et al., 2012). In order to differentiate the antioxidative capacity of different parts of G. procumbens, a recent study was conducted by Krishnan et al. (2015). The study revealed that the root extract showed the highest antioxidant activity when compared to the other parts of the plant. Based on the studies, G. procumbens appears to be a potent source of natural antioxidants probably due to its high phenolic content (Rosidah et al., 2008). The protective effect of G. procumbens against damage of body tissues and organs has also been evaluated. G. procumbens was found to exert a gastroprotective effect as the administration of ethanolic extract significantly lessened the areas of ethanol-induced gastric ulcer in rats; with a reduction of submucosal edema and infiltration of leucocytes was observed (Mahmood et al., 2010). This finding has intrigued the researchers to further explore the protective effect of G. procumbens. In a study on skin damage, the antiphotoaging property of G. procumbens has been discovered as it was found to cause a significant inhibition in the expression of matrix metalloproteinases induced by ultraviolet irradiation in human dermal fibroflasts (Kim et al., 2011). The results obtained in both studies demonstrated that its protective effects might be associated with the ROS scavenging activity of G. procumbens (Mahmood et al., 2010; Kim et al., 2011). G. procumbens is also known to be effective in preventing progressive renal diseases. The aqueous extract of plant was found to cause inhibition of mesangial cell proliferation and DNA synthesis. The suppression of regulator proteins for cell proliferation was found to be responsible for this observed effect (Lee et al., 2007). In addition, G. procumbens was found to have a hepatoprotective effect as it was shown to attenuate the ethanol-induced lipid accumulation in mice livers by modulating lipid metabolism-related genes, particularly via MAPK/SREBP-1c-dependent and -independent pathways (Li et al., 2015). Based on these findings, G. procumbens has significant potential as an organoprotective agent; mainly due to its antioxidative properties which exert a regulatory effect at the level of gene expression. In Thai folk medicine, G. procumbens is commonly used to treat inflammation (Wiart, 2006). It was shown to prevent the increase in ear thickness of mice caused by croton oil-induced inflammation (Iskander et al., 2002). Besides, topical application of ethanol extract on the wounds of tested animals showed significant dermal healing signs, less scar width, and considerable faster healing rate when compared with control group treated with saline (Zahra et al., 2011). Furthermore, the histological analysis has also revealed there is a lesser amount of inflammatory cells at the granulation tissue of wound area and higher amount of collagen with angiogenesis. Recently, the immunomodulatory activity of G. procumbens has been tested using mice splenic cells. The treatment of ethanolic leaf extracts of G. procumbens at 0.1 and 1.0 μg/mL caused higher proliferation of CD4+CD25+, CD4+CD62L−, CD4+CD62L+, CD8+CD62L−, and CD8+CD62L+ T cells but lower proliferation of B220+ cells when compared to the higher dosage at 10 μg/mL. However, at dosage of 10 μg/mL, it was shown to promote high proliferation of B cells. These results have demonstrated that the concentration used in experiment is the determining factor for whether G. procumbens acts as an immunostimulant or immunosuppressant (Dwijayanti and Rifa'i, 2014, 2015). Inflammation and the immune system are closely linked. For instance, the immune system plays a crucial role in the pathogenesis of the inflammatory disorder known as atherosclerosis which can be treated using statins—drugs with anti-inflammatory properties and immunomodulatory properties (Shovman et al., 2002). Therefore, the antiinflammatory and immunomodulatory activity of G. procumbens may be utilized for the treatment of inflammatory diseases or conditions that involve the immune system. Among the existing patents related to G. procumbens, the majority of them are for preparations of traditional Chinese medicine intended for the treatment of various ailments including uterine cancer (Liao, 2015), cervical spondylosis (Shi, 2015), and chronic skin ulcer (Yang et al., 2015). Besides, it has also been used as an ingredient in special diets for patients with medical conditions such as heart (Chen et al., 2013b) and liver disease (Chen et al., 2013a). In the food industry, it has been incorporated into products such as tea (Hu, 2014; Liao et al., 2014; Liu, 2015), kimchi (Jang, 2013), coffee powder (Park, 2015), chocolate (Jang, 2014), candy (Xie, 2007c), and chewing gum (Xie, 2010). The applications of G. procumbens in personal care and cosmetic products have also been reported which including hand-washing solution (Xie, 2009), hand sanitizer (Xie, 2007a), oral spray (Xie, 2007b), facial masks (Yuan and She, 2014), and skin care creams (Xie, 2007d). These patents have demonstrated the high commercial value of G. procumbens and its variety of uses in a number of industries. In summary, G. procumbens has been demonstrated to have high therapeutic value and has enormous potential for application in the development of medical treatments as well as consumer goods. Its diverse pharmacological effects and biological properties (Table 1) are mainly attributed to its flavonoid content (Figure 1). However, there is still limited knowledge regarding the underlying mechanisms of action and exact chemical constituents involved. Further research elucidating the mechanisms underlying the biological activities is needed for development of standardized drugs or herbal products. Table 1. Summary of biological activities of Gynura procumbens. Figure 1. 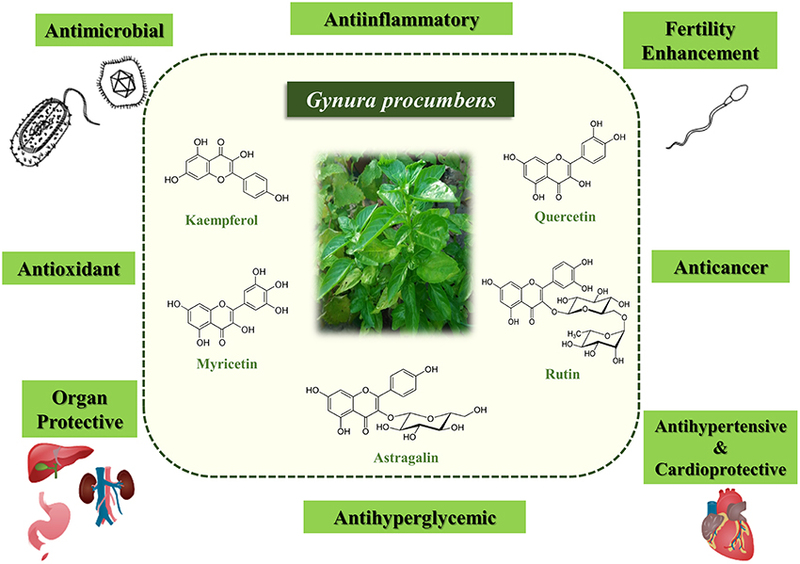 Biological activities of Gynura procumbens and its main bioactive constituents that contributed to the biological activities. This work was supported by FRGS Grant (FRGS/1/2014/SKK01/MUSM/03/2) of Malaysia Ministry of Higher Education, MOSTI eScience Funds (02-02-10-SF0215 and 06-02-10-SF0300), and University of Malaya for High Impact Research Grant (Grant no. H-50001-A000027 and no. A000001-50001). Algariri, K., Atangwho, I. J., Meng, K. Y., Asmawi, M. Z., Sadikun, A., and Murugaiyah, V. (2014). Antihyperglycaemic and toxicological evaluations of extract and fractions of Gynura procumbens leaves. Trop. Life. Sci. Res. 25, 75–93. Bodeker, G., Salleh, H., and Shekar, S. C. (2009). Health and Beauty from the Rainforest: Malaysian Traditions of Ramuan. Kuala Lumpur: Editions Didier Millet Pty Ltd.
Chen, X., Hu, A., and Hu, S. (2013a). Special Diet for Liver Disease Patients. CN. Patent No. 103461985. Beijing: State Intellectual Property Office of the P.R.C. Chen, X., Hu, A., Hu, S., and Zhu, Y. (2013b). Special Diet for Heart Disease Patients. CN. Patent No. 103461986. Beijing: State Intellectual Property Office of the P.R.C. Hamid, M., Saufi, M., and Nik Musaadah, M. (2004). “Study on antidiabetic properties of Gynura procumbens Merr,” in 18 Seminar of the Malaysian Natural Products Society (Kota Kinabalu: Universiti Malaysia Sabah). Hu, A. (2014). One Kind of Sedative Sleep-Aiding Tea. CN. Patent No. 104115963. Beijing: State Intellectual Property Office of the P.R.C. Jang, H. S. (2013). Functional Kimchi Prepared using Gynura procumbens Leaf and use for Preventing and Treating Diabetes Mellitus. KR. Patent No. 2013019844. Daejeon: Korean Intellectual Property Office. Jang, H. S. (2014). Method of Manufacturing Chocolate using Gynura procumbens (lour.) Merr Useful to Control Blood Sugar Level and Diabetes. KR. Patent No. 2014054534. Daejeon: Korean Intellectual Property Office. Lam, S., Idris, A., Bakar, Z. A., and Ismail, R. (1998). Gynura procumbens and blood pressure in the rat: preliminary study. Asia Pac. J. Pharmacol. 13, S14. Liao, G. (2015). Traditional Chinese Medicinal Composition for Treating Uterine Cancer and its Preparation Method and Application. CN. Patent No. 105055807. Beijing: State Intellectual Property Office of the P.R.C. Liao, W., Ling, H., She, X., and Yuan, D. (2014). Gynura procumbens Health Tea. CN. Patent No. 104171188. Beijing: State Intellectual Property Office of the P.R.C. Liu, Y. (2015). One Kind of Passion Fruit-Honeysuckle Health Tea Granule and Preparation. CN. Patent No. 104642594. Beijing: State Intellectual Property Office of the P.R.C. Lu, Y. L., Chia, C. Y., Liu, Y. W., and Hou, W. C. (2012). Biological activities and applications of dioscorins, the major tuber storage proteins of yam. J. Tradit. Complement. Med. 2, 41–46. Park, S. J. (2015). Method for Manufacturing Coffee Powder using Gynura procumbens. KR. Patent No. 1566475. Daejeon: Korean Intellectual Property Office. Quattrocchi, U. (2012). CRC World Dictionary of Medicinal and Poisonous Plants: Common Names, Scientific Names, Eponyms, Synonyms, and Etymology (5 Volume Set). Boca Raton, FL: CRC Press. Shi, Z. (2015). Chinese Medicinal Composition for Treatment of Cervical Spondylosis and Preparation Method Thereof. CN. Patent No. 104815225. Beijing: State Intellectual Property Office of the P.R.C. Wiart, C. (2006). Medicinal Plants of Asia and the Pacific. Boca Raton, FL: CRC Press. Xie, P. (2007a). Hand Sanitizer Containing Gynura procumbens Extract. CN. Patent No. 101036629. Beijing: State Intellectual Property Office of the P.R.C. Xie, P. (2007b). Oral Sprays Containing Gynura Extracts and Metronidazole and Sodium Chlorophyllin. CN. Patent No. 101032539. Beijing: State Intellectual Property Office of the P.R.C. Xie, P. (2007c). Production of Candy for Nourishing Throat from Gynura procumbens. CN. Patent No. 101061823. Beijing: State Intellectual Property Office of the P.R.C. Xie, P. (2007d). Skin Care Creams Containing Gynura Extracts. CN. Patent No. 101032458. Beijing: State Intellectual Property Office of the P.R.C. Xie, P. (2009). Gynura procumbens Hand-Washing Solution and the Method for Preparing the Same. CN. Patent No. 100490779 C. Beijing: State Intellectual Property Office of the P.R.C. Xie, P. (2010). Gynura procumbens Chewing Gums. CN. Patent No. 101036679 B. Beijing: State Intellectual Property Office of the P.R.C. Yang, X., Wang, J., and Xu, Y. (2015). A Traditional Chinese Medicine Preparation for Treating Damp Heat Toxin Accumulation Type Chronic Skin Ulcer and its Production Method. CN. Patent No. 104666446. Beijing: State Intellectual Property Office of the P.R.C. Yuan, D., and She, X. (2014). A Kind of Gynura procumbens (lour.) merr. Instant Polynary Maintenance Natural Compound Facial Mask and Preparation Method Thereof. CN. Patent No. 103961301. Beijing: State Intellectual Property Office of the P.R.C. Zheng, G.-D., Shuai, L.-Q.-W., Li, D.-M., and Zhu, Y.-T. (2014). Extraction and antibacterial effects of Gynura procumbens leaves. Shipin Keji 39, 218–221. Copyright © 2016 Tan, Chan, Pusparajah, Lee and Goh. This is an open-access article distributed under the terms of the Creative Commons Attribution License (CC BY). The use, distribution or reproduction in other forums is permitted, provided the original author(s) or licensor are credited and that the original publication in this journal is cited, in accordance with accepted academic practice. No use, distribution or reproduction is permitted which does not comply with these terms.